See this example of rental schedule for planning your trip! e.g. 2days trip, start trekking on July 20th. This is how it works our rental service! Simple and Easy system for whole process including booking, using and returning! Receiving at hotel reception you stay. They are great help for you! Just simply hand to Hotel reception or Convenience store to send gear back. Prepaid shipping voucher helps you to ship anywhere in Japan without any extra money! If you live in Japan, Delivery to your house in Japan is possible! Delivery possible to your house or apartment if you live in Japan. Please make sure your address is correct! Learn step by step about our rental service. You can learn more about our rental service in detail. Mt.Fuji summer season is from July to mid-September. If you rent gear from us, please visit during the trail opening season. Our gear is for summer time hiking only! Our gear is for summer time Mt.Fuji hiking. Our gear is NOT appropriate for winter trekking. Winter time hiking in Mt.Fuji is not allowed. Please choose your item for your needs. If you are considered that you are not well prepared at the first check point ( Mt.Fuji safety guidance center ), you will be rejected to enter mountain area for your safety. All size charts are based in Japanese size, however you can also see conversion in some item. Please see and read gear size chart and carefully choose your size. Delivery time is normally morning from 9:00 AM to 12:00 PM. If you would like to receive at other delivery time, please inform us when you place your order. We use Yamato Ta-Q-Bin delivery. Learn more about Yamato Ta-Q-Bin? Click here! If you order small items ONLY, we might use an paper bag to send you. We also including a new paper bag for you to return gear. Short notice booking is possible. If we are out of stock, we have to cancel your booking. 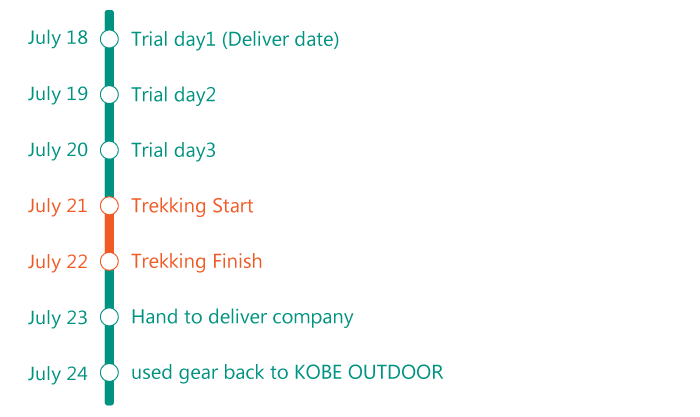 Your rental package might be delivered a day before you go to trekking. We cannot accept any size change or cancel for short notice booking. >>> What’s inside of the delivery bag? You will have unforgettable memories. Please pack everything back to our delivery bag and send it to KOBE OUTDOOR. Attach your prepaid shipping voucher to the delivery bag or the package. If you lost the prepaid shipping voucher, see the instruction manual to get a new one. It is simple and super easy if you use our prepaid shipping voucher. You do not need to pay extra for returning gear if you use our prepared prepaid shipping voucher. 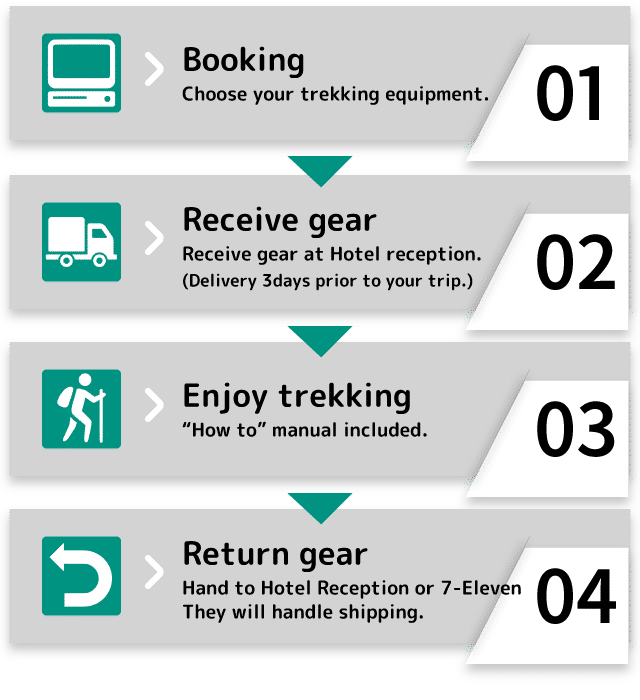 Hand your gear package in the MORNING HOUR BY LUNCH TIME(NOON) to hotel reception or to Convenience store(24 hours shop) like Seven Eleven etc. They will handle shipping back to us with the prepaid voucher. Keep in mind that the prepaid shipping voucher is VERY IMPORTANT for you, so please do not lost it. If you lost, returning can be quite complicated for you. >>> Learn more about returning gear? >>> Where can you send your used gear back to us? Especially for Airbnb customer or customer living in JAPAN. * IMPORTANT : PLEASE READ because you might not receive gear in some case. We cannot deliver to Love hotels because they reject ANY delivery items and you cannot receive them at reception. Delivery to an accommodation offered by Couch Surfing (eg. Airbnb), is NOT POSSIBLE. We cancel your rental booking.